Ahmedabad: Global complex challenges such as climate change, food security, rise of non-communicable diseases, pollution and growing unemployment can be tackled through science and technology for sustainable future. Sustainability Science, the new approach which deals with sustainable future is essential to lay the foundation for solutions required for above mentioned dynamic challenges. 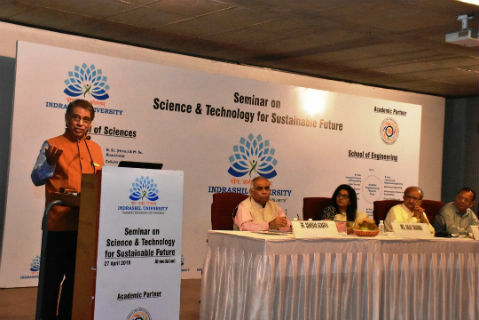 The role of science and technology in dealing with such challenges was discussed at a curtain raising seminar, ‘Science and Technology for Sustainable Future’ at Ahmedabad Management Association (AMA), organized by Indrashil University, an educational initiative of Cadila Pharmaceuticals Ltd. The seminar brought together key stakeholders on a single platform for identifying the gaps that the science & technology needs to fill in to address critical issues. Ms. Anju Sharma, IAS, Principal Secretary, Higher & Technical Education, Government of Gujarat was Guest of Honour. Keynote speakers at the event included Dr. T. Ramasami, Former Secretary, Department of Science & Technology, Government of India; Dr. Deepak Kunzru, Former Professor, IIT-Kanpur; Dr. Rajesh Gokhale, Former Director, IGIB Staff Scientist, National Institute of Immunology, Dr. D.S. Yadav, Former Director, IICT and Bhatnagar Fellow Trustee & Director of Research, Indrashil University and Dr. Damodar Acharya, Former Direcotr, IIT-Kharagpur. The seminar attracted around 200 participants from academia, industry, government, research organizations and statutory & professional Bodies.